Bowen Park is a large greenspace that has forest and a river, but has also been developed in other places with a recreation center, two BBQ pavilions (both with children's playgrounds), disc golf course, two pedestrian bridges, impressive rhododendron gardens, a pool, horseshoes, lawn bowling, tennis, sand volleyball courts, curling, lacrosse, a duck pond, fish ladder and more. 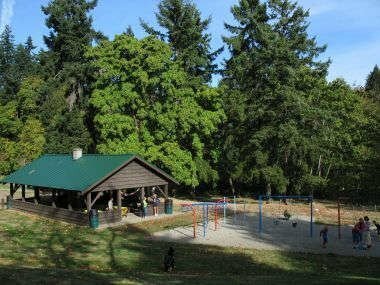 The park is just northwest of downtown Nanaimo. Many people who bike or walk to work will cut through the park for some extra exercise, or for peace of mind. It's also just a nice place to hang out with a blanket under the trees or near the Millstream river. Bowen Park is especially pretty in the autumn, when the big maples have thick, crispy cushions of orange leaves beneath. There are big hills that are great for tobogganing in the winter, and in the spring there are flowers and blooming rhododendrons. The biggest parking area is off Bowen Road (see map location below) near the pool and activity centre. But there is also parking off Wall St, at the park's eastern edge.